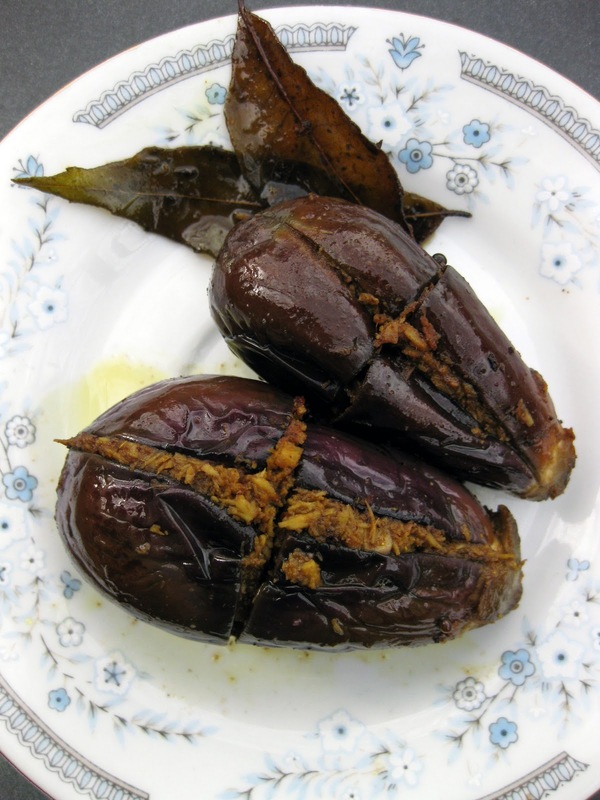 Baby eggplant stuffed with an Indian spice mixture is simply great for eating, period. 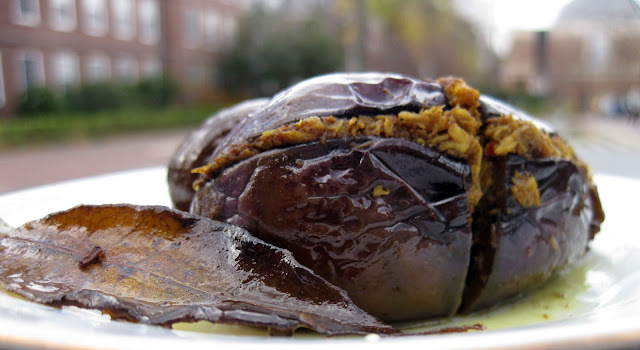 Soft, rich, and extremely flavorful, this preparation is so unlike traditional western eggplant recipe outcomes that a single bite might change your mind about "hating" eggplant. The tiny egg-sized vegetables make for delightful snack-sized servings and are delicious eaten on their own. You can also throw them on a salad, serve them as a side or main course, or accompany them with long-grained rice and seasoned red lentils. Read on to learn how to make this delicious treat! 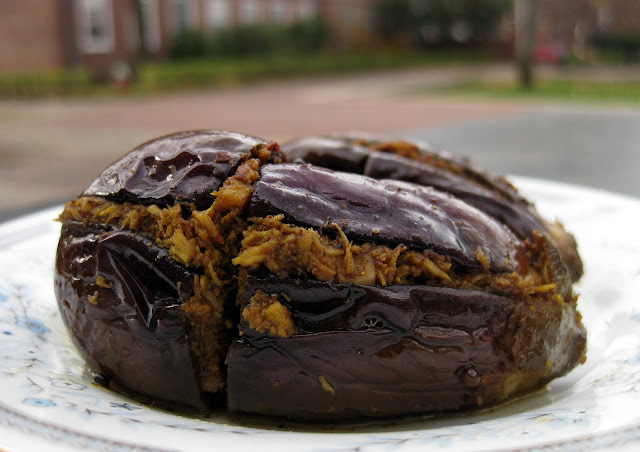 Simply make two cuts in the eggplant and fill it with a tangy, spicy, flavorful filling. There's no need to core or seed the vegetable. Cook in just a touch of oil along with pungent mustard seeds and curry leaves, and you really have something special when you're done. Grated coconut lends body to the filling and holds a quintet of turmeric, coriander, red chili, garlic and cumin; the moisture of tangy tamarind paste pulls it all together. I made the recipe after snapping up some fun veggies at a produce wholesaler while in search of the last fresh figs of fall. Though disappointed to find that not a single fig seems to remain in the entire region, I was elated to find a wide variety of uncommon fruits and vegetables, including the egg-sized Indian eggplants and a bag of nerf football-sized banana flowers. The eggplants pictured were not originally destined for the blogosphere...they were destined for my lunch plate. After having a single taste, though, I realized the recipe was too good not to share. It was going straight into my personal recipe book, and onto the site. Enjoy! Wash the baby eggplants, trim the stalks, and in each eggplant make two intersecting cuts to form a cross that goes about halfway through the eggplant. Place spice filling ingredients in a bowl and mix. Add water, 1 tsp at a time, until you've created a thick paste. Add salt to taste. 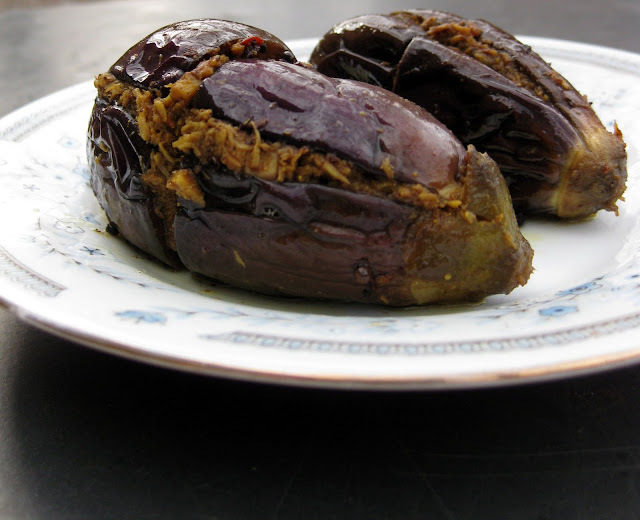 Cram the spice paste into the cuts in the eggplants as best you can. I held the cut open, pressed the paste in, used a knife to push it down, and added some more. This worked pretty well. Heat the oil in a pot or pan on medium to medium-low heat. Add the mustard seeds and curry leaves and cook till briefly..10-30 seconds. Carefully set the eggplants into the pot, cut side up. Some hot oil might splatter up at your arm, so wear long sleeves if that worries you. Cook eggplants a few minutes cut side up, then carefully turn them on one side and let cook, turn to the other side and let cook, and finally flip them cut side down and let cook for a few minutes. Try not to let much of the filling fall out. If the eggplants are not done by the time you've reached this point, continue cooking and stirring occasionally in this manner until the eggplants are done. You will notice the skin of the eggplant change color and the flesh become softer. To serve: Place in serving dish, sprinkle with salt (to taste) and garnish with chopped fresh cilantro leaves. This will make your home smell like an Indian restaurant. Consider yourself warned. Just curious: how much preparation and cooking times do this dish take? Also, your photos remind me of the Corsican stuffed eggplant which is a dish typical of the Corsica island, South of France. My estimate is about 30 minutes. Here's how I think it breaks down: The preparation is quite quick..wash and cut veggies, mix spices, and stuff the veggies. I'd estimate the preparation took about 15 minutes (also, I made 8 of these, not 6). Cooking only took a few minutes per side of the eggplants (I treated them as if they had 4 sides). At an estimated 3 minutes per side, I'd say about 10-15 minutes to cook. Nice to see you like an Indian recipe, that too a brinjal(eggplant) one.We get several types of eggplant and all are cooked in several ways.You can eat them a month or more without repeating a recipe!I have two daughters and they both love brinjal in all its forms.Many in India too do not like this vegetable.You come across as a person who is not averse to trying out new cuisines.So I would like to direct you to a few U-Tube sites that demonstrate Indian recipes in a methodical and lucid manner. Vah Chef, manjula's kitchen,Show Me The Curry and gayatrivantillu.The last is in a native tongue with English subtitles.A small request,when you hear them,do smile but do not laugh and ridicule.English is a foreign language for them.Hope you have a wonderful adventure trying out some recipes.Good luck and God Bless. What a wonderful comment. Thanks for sharing these recipe sites. I do love exploring new things, and trying new preparations of Indian dishes is an activity I love in particular! I won't smirk at poor English -- I have great respect for anyone attempting to speak such an ungainly language, and even more respect for those who teach others. Best wishes to you and your daughters!